Share Market Today: Indian stock markets went up sharply in the late trade on Monday with BSE Sensex finishing at an all-time high and NSE Nifty concluding at a 6-month closing high following the positive sentiments after GST rate cut on multiple goods. 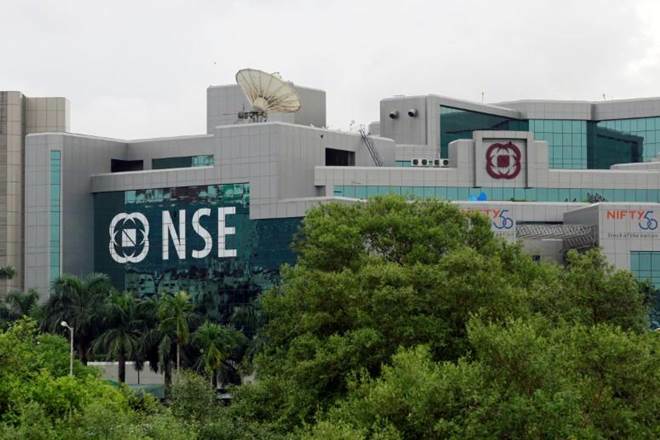 Share Market Today: Indian stock markets went up sharply in the late trade on Monday with BSE Sensex finishing at an all-time high and NSE Nifty concluding at a 6-month closing high following the positive sentiments after GST rate cut on multiple goods. The domestic equities extended gains in the last half an hour of trading with BSE Sensex hitting a new all-time high and NSE Nifty surging to a nearly 6-month high. Shares of big blue-chip companies ITC, ICICI Bank, Maruti, HUL and SBI emerged as the biggest contributors in the Sensex rally to an all-time high today. Sensex and Nifty traded higher in the afternoon session following the positive cues after GST rate cut, further led by the optimism over fresh fund inflows and upcoming Q1 corporate earnings. The domestic equity markets edged up after opening flat withdrawing the concerns of negative Asian cues as GST rate cut on Saturday seemed to boosted sentiments. BSE Sensex surged more than 100 points in the morning session with shares of ITC rising nearly 5%. The major movers were Asian Paints, Bharti Airtel, Adani Ports, ICICI Bank, Hero MotoCorp, Wipro, Reliance Industries, HDFC Bank and Tata Motors. About 1,529 shares ended in green, 1,061 finished in red while 186 closed flat out of the total 2,776 traded companies on BSE. Nearly 55 stocks hit their respective 52-week high whereas 340 stocks hit 52-week lows among all the listed companies on BSE. The wider share indicator NSE Nifty hit nearly 6-month high on Monday. NSE Nifty 50 added as many as 83.2 points to hit a nearly 6-month high of 11,093.4 intraday and finally settled at an exact 6-month closing high of 11,084.75. The benchmark Nifty 50 hit a record closing high 11,086 on 24 January 2018 and an intraday high of 11,171.55 on 29 January 2018. Shares of Vendata (up 4.42%), Adani Ports (3.83%), ITC (3.8%), Bharti Airtel (3.49%), ICICI Bank (up 3.33%), Maruti Suzuki (up 3.31%), Tata Steel (up 2.66%), Asian Paints (up 2.63%), SBI (up 2.09%) and IndusInd Bank (up 1.92%) emerged as the top gainers among all the components of BSE Sensex on Monday. Indian equity markets rose to record highs in the late trade on Monday with BSE Sensex hitting a fresh all-time high after opening flat. Notably, the benchmark Sensex hit a new all-time high on intraday as well as on closing basis. Sensex concluded up 222.23 points or 0.61% at an all-time closing high of 36,718.6 after touching an intraday record high of 36,749.69. Though there is a point difference of only nearly 2 points between fresh all-time high and previous all-time high. The S&P BSE Sensex hit a new all-time high today. 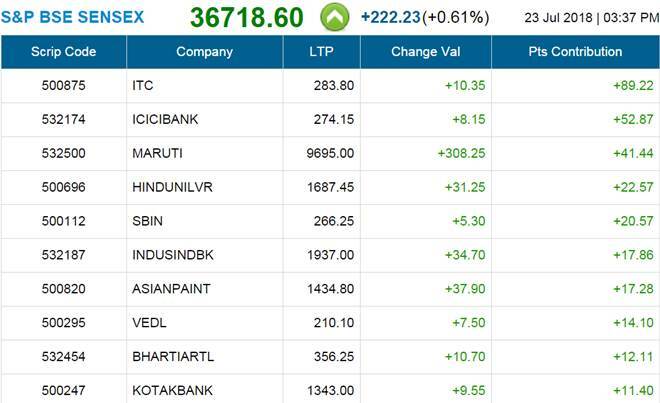 The benchmark Sensex hit fresh all-time high in the late afternoon deals on Monday. BSE Sensex rose 253.32 points to a new all-time high of 36,749.69 with few minutes still left for trading. While, on the other hand, NSE Nifty made a day's top of 11,093.40, up by 83.2 points. HDFC Bank's Rs 24,000-crore capital raising will increase capital buffers of the bank by 3% points and help support the lender's over 20% loan growth for the next few years, said Moody's. The Rs 8,500-crore infusion last week through a preferential allotment to parent HDFC will increase the common equity tier 1 (CET1) ratio by about 1% points to 13.3% from 12.3% reported in March 2018, global rating agency Moody's Investor Service said in a report. China said on Monday the value of its currency is driven by market forces and that it has no intention to devalue the yuan to help exports after Washington said it was monitoring the currency's weakness amid the escalating bilateral trade row, Reuters said in a report. Indian stocks went higher in the afternoon trades discarding the subdued activity in regional Asian markets with Sensex rallying nearly 200 points. The benchmark S&P BSE Sensex rose 196.39 points to a day's high of 36,692.76. BSE Sensex is now hovering around its all-time high of 36,747.87. The Finance Ministry is planning to transfer government shares of 10 PSUs, including MMTC, ITDC, MRPL, Hindustan Copper, to a fund to meet Sebi's minimum public shareholding norms, PTI reported citing unidentified sources. With the deadline looming, the ministry is contemplating to shift government shareholding in the 10 PSUs to 'Special National Investment Fund' (SNIF) to meet the market watchdog's norms as it may not be possible to sell stake in these companies in the current market conditions, the report added. Bata India shares hit all-time high! Shares of Bata India Ltd rose 7% to an all-time high of Rs 901.7 after the Gurgaon-based footwear maker posted a 36.6% rise in Q1 FY19 profit. Indian equity markets traded higher holding the early gains in the afternoon session on Monday with Sensex hovering beyond 36,600 and Nifty making a day's high of 11,060. Shares of ITC, Bharti Airtel, Adani Ports, ICICI Bank, SBI, HUL, IndusInd Bank, NTPC, Tata Motors, Vedanta and Asian Paints are the top gainers. Shares of Havells India rose 9.6% to an all-time high of Rs 614 after Q1 FY19 results and company's move merge all of its India-based subsidiaries with itself. Havells India reported a rise of 73% in the April-June period of FY19 beating Reuters estimates. Havells' profitability to improve following the strong revenue growth recent weakness in commodity prices, Kotal Institutional Equities was seen as saying in a Reuters report. The stock of Havells today marked biggest intraday percentage rise since December 2015. The Goods and Services Tax (GST) Council cut tax rates on scores of items such as paints, leather goods, televisions and washing machines in a move aimed at appealing to traders and the middle classes as Prime Minister Narendra Modi's government faces general elections next year, a Reuters report said. Asian markets were mixed on Monday as concerns over trade tensions moved to the forefront at the meeting this weekend of the Group of 20 industrial nations, Associated Press reported. Japan's Nikkei 225 tumbled 1.3% to 22,401.08, South Korea's Kospi dropped 0.9% to 2,269.31, Hong Kong's Hang Seng added 0.3% to 28,295.55 while China's Shanghai Composite Index gained 1.1% to 2,860.39. HDFC Bank's June-quarter net profit of Rs 4,601 crore missed the Reuters estimate of Rs 4,766 crore. The amount set aside by a bank to cover a future liability rose to Rs 1,629 crore from Rs 1,559 crore. Strong cost control offsets weaker topline trajectory, retain Buy with a target price of Rs 2,530, Jefferies was seen as saying in a Reuters report. HDFC Bank has adequate levers to generate healthy operating profit, earnings growth; however, quality has been disappointing as the bank had to slow down operating expenses to offset NIM pressure, Reuters reported citing Kotak Institutional Securities. According to a Reuters report, 44 analysts have rated HDFC Bank stock either as a 'Strong Buy' or a 'Buy'. Shares of the chemicals manufacturer UPL extended gains in the mid-morning session after rising heavily in the morning session on the buzz of Arysta LifeScience acquisition. The stock of UPL went up by 14.74% to a day's top 631.35 on BSE. Indian stock markets are traded higher in the mid-morning deals with BSE Sensex rising over 100 points and NSE Nifty hovering around 11,050 following the sharp uptick in the shares of ITC, HUL and ICICI Bank. 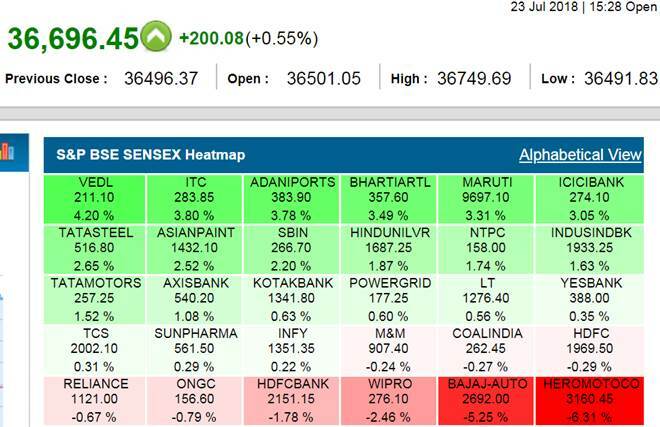 BSE Sensex trading up 86.47 points or 0.24% at 36,582.84; NSE Nifty trading 11,044.15, up by 33.95 points or 0.31%. Shares of heavyweight large-cap stocks Reliance Industries and HDFC Bank were the biggest contributors in pulling BSE Sensex down. These two stocks alone washed off about 80 points from the Sensex. The Indian rupee was trading firm against the US dollar on Monday after gaining as much as 20 paise per unit US dollar in the morning deals. The rupee is trading 16 paise higher at 68.6875 apiece US dollar, Bloomberg data showed. The rupee added 20 paise to 68.6625 in the early session at the foreign exchange market today. Volatility in the domestic equity markets declined on Monday. India Vix, the volatility indicator of NSE, fell 10.84% to a day's low of 12.0675 today. Good news for Indian rupee? The US dollar slumped against major peers on Monday while the Japanese yen spiked on reports Japan's central bank is debating moves to reduce its massive monetary stimulus, a Reuters report said. Shares of the domestic aircraft carrier SpiceJet rallied more than 9% in the late morning deals on Monday. The arbitral tribunal ruled in favour of SpiceJet with regard to disputes with former SpiceJet owner Kalanithi Maran and KAL Airways Pvt Ltd (claimants), Reuters reported. Shares of most of the paint manufacturer were trading higher today after the applicable GST rates were brought down to 18% from 28% in the latest GST Council meeting held on Saturday, 21 July 2018. Shares of Asian Paints surged nearly 5% to Rs 1,464.4, Akzo Nobel gained 2.3%, Kansai Nerolac Paints rose 1%, Berger Paints gained 0.3%. Civil engineering and EPC firm JMC Projects (India) has secured orders worth Rs 556 crore in the domestic market with an order worth Rs 283 crore for laying of water pipeline in Orissa. Shares of India's largest FMCG firm ITC rallied nearly 5% to day's high of Rs 286.5 on BSE. The stock of ITC was the biggest gainer among all the components of BSE Sensex today. BSE Sensex was trading up 58.01 points or 0.16% at 36,554.38 while NSE Nifty was trading at 11,027.85, up by 17.65 points or 0.16%. The 30-share barometer Sensex has surged 134.45 points to hit a day's top of 36,630.82 earlier today. 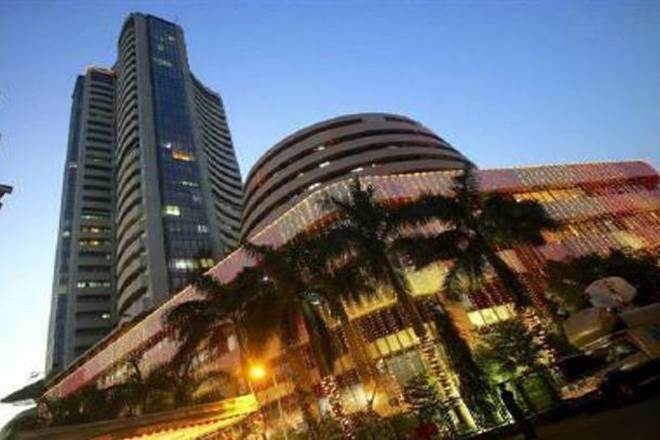 The benchmark BSE Sensex advanced over 100 points in early trade today led by gains in FMCG stocks after the GST Council on Saturday cut rates on over 100 items, amid fresh capital inflows by foreign funds and strengthening of the rupee, PTI said in a report. Shares of India's largest bank by market capitalisation and the second-largest bank by assets HDFC Bank fell 2.29% to a day's low of Rs 2,139.95 after the Aditya Puri-led bank reported a rise of 18% in the standalone net profit to Rs 4,601.44 crore for the June quarter of FY19. HDFC Bank's asset quality weakened slightly on a sequential basis as gross NPAs came in at 1.33% as at 30 June 2018 from 1.3% as at the end of 31 March 2018. Shares of chemicals manufacturer UPL rose 7.77% to Rs 593 after the Mumbai-based company signed a definitive agreement with Platform Specialty Products Corporation to acquire Arysta LifeScience Inc. and its subsidiaries (collectively 'Arysta'), a global provider of innovative crop protection solutions, including BioSolutions and Seed Treatment, for approximately $4.2 billion in cash consideration. Shares of the mobile and website search engine services provider Just Dial surged more than 4% after the Mumbai-based company approved a share buyback program of Rs 220 crore. The board of Just Dial approved a proposal to buyback up to 27.5 lakh equity shares for an aggregate amount of Rs 220 crore. Just Dial has fixed the share buyback price at Rs 800 per equity share, which is 38% higher than the Friday's closing price of Rs 579.7 on BSE. Shares of New Delhi-based jewellery maker PC Jeweller rallied more than 14% in the early session on Monday. The stock emerged as the top gainer among all the constituents of 'A' group on BSE after rising 14.16% to Rs 93.5. Shares of Multi-Commodity Exchange fell as much as 5% to a day's bottom of Rs 758.30 on BSE today. The stock was the second-biggest losers among 'A' group of shares on BSE after South Indian Bank (down 16%). MCX has reported a decline of 77% in the Q1 FY19 net profit to Rs 6 crore following an exceptional loss of Rs 24 crore in the reporting quarter. In the early morning trades, Wipro share price fell nearly 7% after the Bengaluru-based IT company weaker-than-expected Q1 FY19 results. Meanwhile, Asian shares dipped on Monday on fears of more protectionist measures from the United States while the dollar declined against major currencies after US President Donald Trump criticised the Federal Reserve's tightening policy, Reuters said in a report. Crude oil prices were mixed on Monday as finance ministers and central bank governors from the G20 warned that risks to global growth have increased with rising trade and geopolitical tensions among other vulnerabilities, the report added.